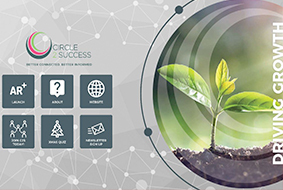 After designing an innovative Augmented Reality App (AR) for the very popular and expanding Gloucestershire-based Circle2Success (C2S) business network, it was a perfect choice to use this innovative technology to launch the App at the C2S Christmas Party. Held at The Manor by the Lake in Cheltenham, the event was well attended by a good number of the 170+ C2S members and each table was buzzing with intrigue as they tried to answer AR triggered quiz. Ten questions came to life when guests pointed their mobile phones at each printed trigger quiz cards, scattered around the tables… some launched videos and others animated 3D models. With a combined turnover of over £6.5 billion, the C2S members businesses are based throughout Gloucestershire, Bristol and Worcestershire, and are now expanding into South Wales, Wiltshire and Warwickshire. Feedback from the C2S Managers and several members shows that everyone thought that the AR App was a fantastic addition to the Christmas Party, and since the event we have received enquiries from business Directors regarding commissions of this technology for their own organisations.